Mandatory Helmet law (MHL) alone does not prevent accidents on the road, yet it comes with side-effects that can have a negative impact on cycling promotion and is likely to hamper the government’s Car-lite initiative. How to reduce the negative side effects of the Mandatory Helmet Law while saving the high-risk cyclists during accidents? Mandate helmet wearing for those riding fast on roads (40 km/h). Exempt the cyclists going below 40 km/h from the MHL. Slow cyclists may choose to wear or not to wear helmet depends on their trips. In addition, enhance education targeted at young cyclists. On August 2018, the Active Mobility Advisory Panel (AMAP) recommended the “Mandatory Helmet Law” for cycling on road. On September 3rd, the recommendation was subsequently accepted by the Minister of Transport. Helmet wearing and Helmet laws are hot topics in any cycling forum. There is a heated debate with strong opinions on both sides. There is no dispute that a helmet may save a life in an accident. However, a helmet is only a personal protective device, it is not an accident prevention device. The best helmet cannot prevent accidents from happening. In any case, introducing the MHL (Mandatory helmet law) is not as simple as “Helmet saves lives”. There are implications and “side effects” which can have a negative effect on cycling promotion and is likely to hamper the government’s Car-lite initiative. For helmet wearing, there is a significant difference between “Advice”, and “Mandating by law”. The former, “Advisory”, allows a person to exercise his or her own freedom to decide when and where it is necessary to wear or not to wear a helmet. Since the cyclist is the best person to determine if his/her proficiency, route character, timing etc require him to wear a helmet or not. The latter, “Mandatory”, limits the freedom when the individual feels it is really unnecessary to do so. Up to 2018, cyclists are advised to wear a helmet when cycling on roads but it is not mandatory. As a result, both types of cyclists exist on the roads. Every weekend, it is easy to spot groups of sports cyclists wearing helmets on their long-distance training rides along Mandai Road, Upper Thomson Road, or Tanah Merah Coast road. On the other hand, less obvious, yet there are numerous bicycle users in all parts of Singapore riding a bicycle or share bikes without a helmet every day. These include all walks of lives from young to old. They are usually slow riders and mostly ride on the sidewalks. However, from time to time, they also need to ride on the roads when it is safe, more convenient or the pavement is not available. From Traffic Police statistics, the yearly fatal road accidents involving bicycles and eBikes were below 20. It is a concern yet this figure is not particularly worse than in any other city. Cyclists not wearing a helmet and received fatal head injuries are not reported, it is estimated that the number is well below 10. In line with the government’s Car-lite initiative, I wonder if there are ways to optimise the upcoming MHL in order to address the key safety issues of on-road cycling and to reduce the negative impact on the majority of the “Slow cyclists” in Singapore. The helmet issue is a Red-Herring: The cyclist’s vulnerability on road is NOT due to lack of helmet wearing only. Instead, it is more due to some dangerous behaviour of both drivers and cyclists (e.g. Using handphone while driving or cycling, driver overtaking within the same lane as the cyclist, cyclists riding too fast and too near the curb with an uneven surface) as well as bicycle-unfriendly road design. The helmet issue distracts the public and policy maker from the real solutions we need to implement to prevent accidents from happening. Lack of data support: Cycling on road is not new. We should have local accident data to support mandatory helmet wearing. So far, there is no strong evidence showing “on-road, non-helmeted cyclists receiving head injuries is a big issue.” Excluding the helmeted eBikes and Sports cyclists, the total number of cyclists involved in road accidents is fairly low. International benchmark: out of 195 countries, Australia and NewZealand are the only two countries to have countrywide Mandatory Helmet Law. Research supporting MHL, published in 2016, which reviewed 40 studies worldwide covering 64,000 injured cyclists, found that helmets can reduce the chances of serious head injury by almost 70 per cent and fatal head injury by 65 per cent. However, while helmet is useful for personal protection, it cannot prevent accidents, both Australia and NewZealand are suffering from high cyclist fatality rate on roads as well as low bicycle usage. On the other hand, countries with highest bicycle usage and good safety records all don’t have MHL. These countries are famous for their bicycle friendly infrastructure, such as The Netherlands and Denmark, or good driving and cycling etiquette such as Japan and Taiwan. Share bike: Share bike has quickly become an important mode of transport which enhance the Car-lite initiative. In many areas, such as Joo Chiat and Sembawang, the cycling/walkway network is limited. In such area, most share bike users need to ride on the road. Imposing the MHL means that share bikers will have to carry a helmet all the time just in case they may need to use the Share bike at some point of their journey. MHL may also increase the cost and complexity for the bike share operators if they are forced to provide fitting helmets for their riders. Sizes, hygiene and availability of helmets at the points of needs is a huge logistic challenge and may cause the share bike operation not viable. Slow cyclist: The vast majority of local bicycle users are slow cyclists, such as the “uncles” riding to a nearby market for a “kopi” or a mother bringing her kids to school. For safety reasons, they usually cycle on walkways, which may appear that the MHL won’t affect them. However, in practice, most of them need to ride on the road partially along their usual trips. This is due to disconnections between walkways, PCN and shared paths. The MHL would force them to carry a helmet for their daily trip, which will add a burden to their choice of a bicycle as a mode of transport. Reckless youngsters: There are a number of young riders who cycle on the roads quite recklessly. Given the way they are riding on or off roads, in an accident, the injury would bound to be serious or fatal. The MHL may reduce their risk of suffering from head injuries, but it will not shield them from other serious and fatal injuries. Education target at this group to increase their awareness will be more effective to improve their safety. Sport cyclist: This is another high-risk group due to their speed and proximity to fast traffics. Every weekend, it is easy to spot groups of sports cyclists racing along Mandai Road, Upper Thomson Road, or Tanah Merah Coast road. MHL is very suitable for this group of fast, on-road cyclists. They are fast, as fast as a motorcyclist or cars and likely to suffer similar injury impact as motorcyclist going at a similar speed. Going through the list above, the upcoming MHL is likely to have a negative impact for Share bike (4) and Slow cyclist (5), but it will enhance the safety of Sports cyclists (7). Perhaps it would make sense to target the MHL at the Sports cyclist but not the Share bike users and slow cyclists? MHL for the cyclists riding fast on roads (e.g. 40 km/h). Exempt those cyclists going below 30 km/h. Slow cyclists may choose to wear or not to wear helmet depends on their trips. In terms of enforcement resources, it is easy to spot a cyclist going very fast on road verse a slow cyclist, therefore enforcement of the MHL would not be overly complicated. Fundamentally, I believe in the Car-lite vision. Road safety and cyclist’s safety can be improved by coherent policies, which support health, the environment, and personal choice. This entry was posted in AMAP, MHL and tagged Active Mobility Advisory Panel, AMAP, Helmet Law, Mandatory Helmet Law, MHL on 2018-09-24 by Francis. This one of the most frequent asked question from new riders joining our Sunday rides. To be frank, no one want to hurt others but due to the inability to control their bike, new riders fear they may hurt others unintentionally. Observation over the years, I come to the conclusion that bike handling at slow speed is the key skill that every cyclist should acquire before they venture into footpath and sharing the space with pedestrians. I believe most accidents involve cyclists on foot path is due to the inability of controlling the bike at slow speed, or lack of awareness of blindspots. Such cyclists need to ride at speed in order to keep their balance, even when they approach pedestrians or blindspots. Slow cycling skill is not rocket science and can be learn fairly easily. It can be a fun personal challenge to see “how slow you can ride”. Last week, with the support of NPark and OCBC, Lovecycling SG organised a “Slow bike handling skill workshop” at the Road safety park at the East Coast Park. Encik George Lim, the master trainer, guide the participants through a number of small challenges; started from stopping your bike, riding along a straight line, S-course and Zigzag course to riding the 888 challenge. At the end of the training, to test if everyone is ready to share paths with pedestrian, we throw in an “acid test” – simulation of a kid running randomly in the group of slow riding cyclists and see if everyone can avoid any accident. Sounds dangerous? Not really. More details of the entire workshop which include a bike servicing part can be found on Taiwoon’s blog. This entry was posted in newbie on 2017-01-10 by Francis. In the early Saturday morning, PM Lee planted a tree at the Sengkang Riverside Park, commemorating the start of phase one of the Round Island Route (RIR), an idea conceptualised in 2011. Construction work on the first 60km of a 150km continuous green trail that will go around Singapore will start at the end of the year. This is an ambitious project to enhance connectivity and create new recreational spaces for cyclists and park goers all around Singapore. Later in the morning, after riding through a new 4km “red-carpet” cycling path, PM Lee announced the completion of the first phase of AMK Cycling town network. This officially initiated the transformation of Ang Mo Kio into a model cycling and walking town. Estimated by 2019, a total of 20km of cycling paths will be completed to connect to most parts of AMK town. Innovative ideas including the distinctive red-colour paths, safer crossing and elevated share path under the MRT viaduct are to be piloted in AMK. If all are good, future cycling town will adopt the innovative ideas. Perhaps more important is to see the number of senior level politicians and government agents (URA, LTA, NPark, HDB, Finance) who are actively involved on stage or behind the scene. This is a clear sign showing that there is strong alignment within the government to realise the car-lite vision. Facebook post by PM Lee Hsien Loong. This entry was posted in cycling town, daily commute, News, Uncategorized and tagged AMK cycling town, Lee Hsien Loong, Round Island Route on 2016-07-15 by Francis. At the end of 2014, during the “Clean and Green Singapore 2015” event, PM Lee announced that he will take up the challenge to turn Ang Mo Kio into the “next generation cycling town with innovative infrastructure” to facilitate more people to use bicycle as a mode of transport. True enough, we visited the first phase of the cycling network and it is indeed a big improvement over the previous standard from Tampines. cycling paths are all in a distinctive reddish color, make it clear which is supposed to be the cycling path. The path stop before area with high pedestrian traffic, such as bus stop, or road crossing, signal that cyclist should slow down and check for safety before proceeding. Hump up road crossing at minor road junctions helps to slow down the cars before the crossing, makes it much easier for all road users to look out for each other before entering the crossing. More details of the AMK cycling town in the the news. Discussion on FaceBook about the news. This entry was posted in Uncategorized and tagged AMK cycling town, URA on 2016-06-13 by Francis. The idea of Aero-Ride is inspired by Aeolian Ride (details in the video). We keep the original elements of fun, love of biking, a sense of humour, silliness. Now instead of using white fabric, we re-use waste plastic bags to construct the inflatable costume. It turns out that the thin plastic material is easier to inflate and has many possibilities to create many different shapes. Below is a step by step illustration to show how to construct a simple Aero. Get a used plastic bag with a width larger than your shoulder. roll up the edge. use tapes to keep the rolled edge. reverse the plastic bag, stick the centre to top of a cap. congrats, you’ve made your own Aero. You are ready for Aero Ride! This entry was posted in Uncategorized and tagged Aero, Aero Ride on 2016-05-27 by Francis. There are many activities suitable for everyone from young to old. You will see the Civic area as well as part of CBD transformed into a fun area, totally different from a normal day filled with cars. You can choose to cycle, run, or walk along the large CBD loop from 7-10am, or the shorter Civic loop from 7-12 noon. Fitness lover can join the fitness party or outdoor yoga at Empress Lawn. Kids can have lots of funs to play football at Connaught Drive, join a fun race or play frisbee in Esplanade park. This entry was posted in Uncategorized on 2016-04-21 by Francis. 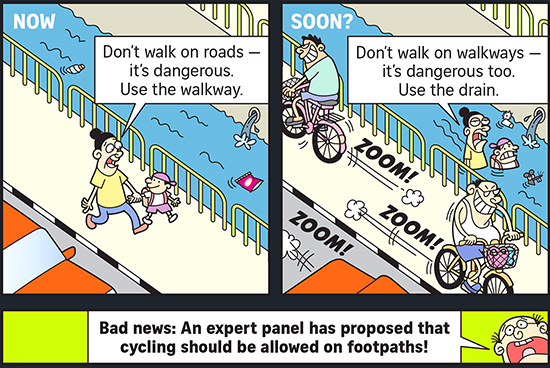 Mar 17th, 2016, Singapore: The Active Mobility Advisory Panel submitted its proposed rules and code of conduct for the safe use of footpaths, cycling paths and shared paths to the Transport Ministry. This is seen as a significant step towards the Car-Lite vision of the Singapore government. Currently there are 300 km of “cycle-able” PCN and cycling paths in Singapore. This is great for recreation but not sufficient for daily trips to work, to school or to the markets. Cyclists, especially the slower riders, are faced with two difficult choices: to risk their life by cycling on roads mixing with fast moving cars, or ride on the foot paths illegally. The proposal from the 14-members panel legalise cycling on pavement, effectively unlocking the potential of 3300 km of foot paths along all the roads. However, for this to work, safety of pedestrian must be addressed. The sets of rules and code of conduct is targeted to ensure safety for all. This entry was posted in Uncategorized on 2016-03-23 by Francis. Cheers to the first Car Free Day in Singapore- in LovecyclingSG style! In 2014, Car Free Day in Singapore was a dream, and last Sunday the dream finally comes true! On October 3rd, 2014, URA team bring along key members of LTA, SLA, SDCF and Mr. Peter Ong, the Head of Civil Service, to study how the KL Car Free Day is organized. Last Sunday, March 28th, 2016, we had the first Car-Free Day in Singapore, and it was a great success! Car-Free Sunday SG turns part of our city into a pedestrian and cyclist friendly precinct and creates a 4.7 km route of closed roads in the heart of the city. It is part of the larger movement towards a car-lite Singapore, envisioning our city with fewer cars. The trial will kick off with an exciting lineup of activities on 28 February. It will continue take place on the last Sunday of the month for a six month trial period. LoveCyclingSG supported the Car Free Day by organising four concurrent events. One of the groups joint the flag off at 7am in front of the National Gallery, which includes families with kids and “pets lovers”, all on bicycles. The other three groups starting three “Ride-to-Car-Free” concurrently at 7am from the East (Kembangan MRT), the North (Bishan Park) and West (Clementi MRT). These three groups were led by our veteran, or “LCSG Angels”. It was a great opportunity for inexperience riders to follow the leads and test out the route from heartlands to CBD. The responses were overwhelming. Both East (led by George and Berenda with ) and West (Led by Andy and Stanley) group had close to 100 pax and the largest group was the North (led by Clarence, Desmond and Kenneth with PNRs) which was 130+ riders. All together it was estimated we have a total of 400+ participant from LoveCyclingSG. It was the biggest event we have mobilised so far. Apart from cycling, there were many interesting programs running at the same time, walking, jogging, running, skating, and even mass Yoga. Kevin from National Gallery helps to arrange valet parking for our bicycle at the basement car park, so that the riders can join other events without worry about their bicycles. Typically very quiet on a Sunday morning, the whole CBD area has been transformed from into a caravel and fun playground for thousands of participants. This entry was posted in Uncategorized on 2016-03-10 by Francis.